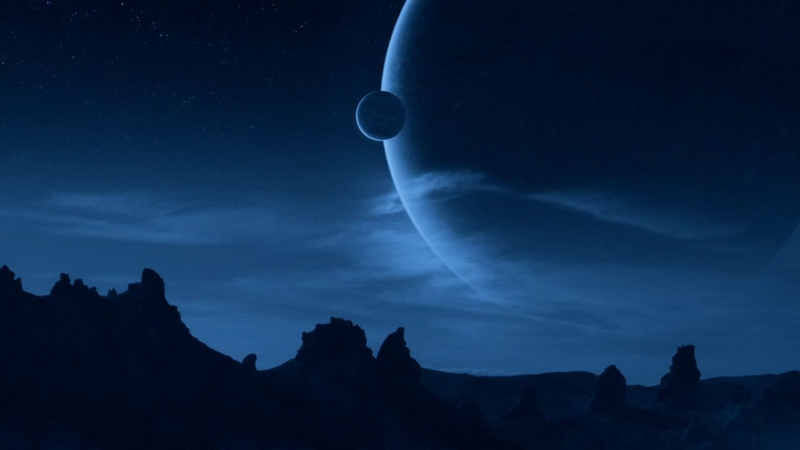 Last night was the midseason finale of Agents of SHIELD, and it put a pretty definitive capstone on the “alien planet” storyline as well as the ATCU storyline. Most importantly, it gave a few of our main characters some defining choices, which turned out about as well as you’d expect. The most chilling part of the episode is the final few minutes—first, the look on Coulson’s face as he hugs Melinda May on his return from the planet he christened Tatooine. And then, Grant Ward’s triumphant return from the other planet, except now he’s an evil alien zombie, possessed by the creature that devastated an entire civilization that once had nine great cities. Ooops. Phil Coulson absolutely chooses revenge over expediency, and Grant Ward is sort of right when he says that this is a short-sighted and ultimately self-destructive path. Coulson is still in the middle of grieving for Rosalind, as we see in a dream sequence when he’s still unconscious on the alien planet, and he’s basically determined to kill Ward no matter what it takes. He does keep Ward alive long enough to locate Fitz, who’s heading for the portal that will get him and his new friend Will off the planet. But then there’s a moment when the portal is closing, and Fitz is telling Coulson to leave Ward, and Coulson just can’t. He has to finish Ward, with his bare hands. Specifically, with his cyborg hand, which he then removes and leaves at Ward’s side. Judging from that last shot of Coulson’s face, this cold-blooded murder leaves a mark on him, even with all the other people he’s killed over the years. And it seems as though Coulson’s thirst for revenge is what enables that alien thing to possess Ward’s fresh corpse and get the frak off the planet. Grant Ward, meanwhile, finally makes his choice. Early on in the episode, he discovers a huge structure that his Hydra brethren apparently built on the alien planet, and is filled with a new devotion to the cause. He finally believes in something greater than himself, and no longer has any need for closure or revenge. Before, he was just attaching himself to Hydra to get a father figure, and then to get payback against his former SHIELD buddies—but now he’s seen something that actually convinces him. He seems actually sincere when he tells Coulson that he’s moved past all of the petty concerns that are motivating Coulson right now. In fact, Ward seems like he might not even mind sacrificing his life so that the monster can get a path to Earth. Fitz’s choice is the saddest of all, in some ways. He makes this huge noble effort to reach out to Will—he actually risks his life to get to Will, and then convinces Ward that they need Will to get them to the portal. And he is incredibly sweet to Will, his main romantic rival for Simmons, treating him as an ally and friend from the first second they meet, because if Simmons trusts this man then so does Fitz. Even Will seems kind of startled by how decent Fitz is being. And then... “Will” can’t help reminiscing about the civilization that was on this planet, and how the planet’s inhabitants had a chance at greatness but threw it away. And Fitz realizes that he’s been “nobly” protecting the monster that Hydra came here to find, because this is actually a zombie reanimated by the alien creature. Fitz is forced to shoot Will several times, and finally light him on fire with a flaregun—which at least succeeds in driving the creature out of him. And then Fitz has to tell Simmons that Will, who saved her and cared about her, is dead, which is a moment we see without any dialogue, but the looks on their faces are enough. Simmons makes the choice that will probably haunt her the most. She has just escaped from the Hydra goons who were holding her prisoner, and quite possibly planning to kill her as soon as they got their portal open again. And she finds the containment module that is keeping Dr. Andrew Garner, Melinda’s ex, under wraps. Andrew convinces her that if she lets him go, he’ll protect her—and he actually delivers on his promise, killing the Hydra goons and leaving Simmons unscathed. But then, fully transformed into Lash, he goes on to do what he does best: Kill all of the Inhumans that Hydra has brought to the evil castle, to provide an army for the alien creature when it comes to Earth. (The mechanism of that army is left unexplained—do Inhumans have a basic in-built need to obey the alien creature? In which case, how is that going to affect Daisy? Or was this just Hydra’s fond hope?) In any case, a dozen Inhumans are slaughtered so Simmons can escape, and the look on Melinda May’s face when she realizes is pretty crushing. Simmons is going to have to live with that blood on her hands. Mack, meanwhile, is stepping up and being a real leader to the SHIELD crew. Coulson made Mack acting director when he decided to go “rogue” and go after Ward. And it’s really in this episode that Mack takes the leadership mantle seriously, commanding the rescue mission at the castle and keeping all his people alive. The bit at the end when Mack decides to stay behind and blow the portal, and then his crew starts concocting an alternate plan that risks more lives—but then Mack says “what part of ‘that is an order’ did you not understand?” is great. It’s pretty clear, at this point, that Mack is actually a better SHIELD director than Coulson because he has more perspective and a better ability to step back and see the big picture. And he’s less obsessed with keeping secrets for the heck of it. It’ll be interesting to see if Coulson recognizes that—especially once Coulson is forced to confront the results of his petty thirst for revenge in this episode: Zombie Ward!